What can I say but -WOW !!! I am totally enthralled by the new SchoolhouseTeachers.com site. For only having been open for about 3 weeks, this site has A LOT of great resources. Although this site was originally a brainchild aimed to help home educators get great resources at a small price, it has become so much more. This would be an excellent resource for any parent, teacher, grandparent, or Sunday School director. Don't let the small price tag fool you: the Ultimate Membership at $5.95/month or $64.26/year (10% discount) comes with thousands of dollars of great educational ideas, resources, e-books, and links. ****Updated 9/30/2014***** The price has gone up, but don't worry, there is SO MUCH on the updated SchoolhouseTeachers.com that you'll never run out of things to learn about! You'll recognize several other key figures in the Home educating field like Adam Andrews (Teaching the Classics) or Terri Johnson (Knowledge Quest.) I personally love the down-to-earth Home Ec style of Malia Russell of homemaking911.com. She tells it truthfully and full of grace! So why not join SchoolhouseTeachers.com, and find out your favorite things about sunflowers? If you're needing some encouragement, there are recorded sessions of the 'Expo-to-Go' that The Old Schoolhouse has done in the past to listen to whenever you can fit it in. Some of these sessions would be awesome resources for either private or public school teachers as well. I am especially looking forward to each month's lessons from Diana Waring. We have always loved her curriculum. (She is one of a very few authors that this extremely frugal Mama will pay to have her own copy of the curriculum from.) She will feature a monthly "Life Lessons from Christian Luminaries." I love having our girls study something useful and inspiring! So- are you ready to take the plunge? Get inspired? Be refreshed? Then head on over to SchoolhouseTeachers.com and enjoy the most frugal way to home school I've seen outside of only using your Bible and the McGuffey Readers! It's only the 12th of March, which in Indiana means anything is possible with the weather. 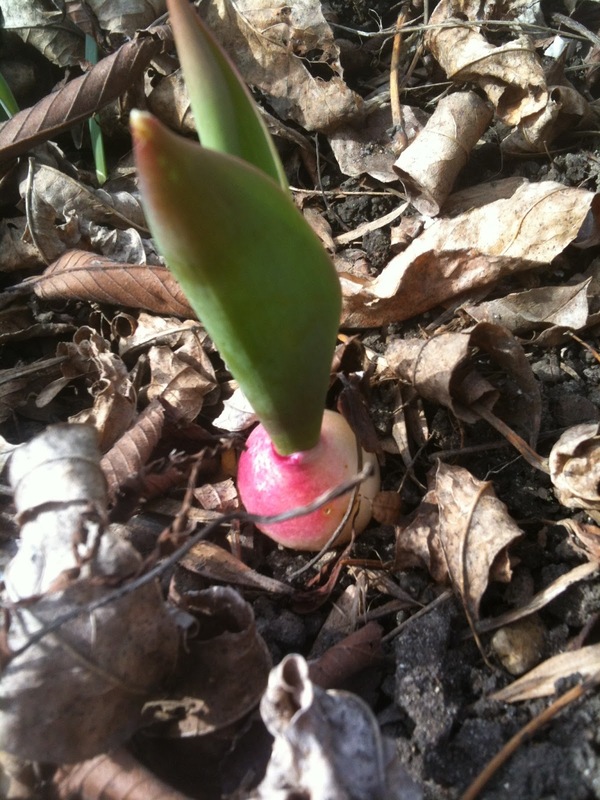 I wanted to show you a picture of a confused tulip from our front yard. It made me laugh. It is obviously lacking the genetic information to stay in the ground where it belongs. So, we helped it out by digging it a new home & burying it again. We'll just have to be patient and see if it stays where it was planted. Hopefully you've been blessed with mild Spring weather as well, and are spending some time outdoors enjoying the sunshine. Enjoy the warm weather, plant some seeds, and hug your kids this week! Thanks, but No Thanks for your unsolicited advice! It's that time of year again, when it's almost Spring, and it seems like we're all wanting something new. Gardeners look forward to new seeds, home educators look forward to new books, and I think Dads are looking forward to some more time doing anything- OUTSIDE! As your exuberance spills forth, and you're wanting to try something new, or maybe just do the same thing again that worked before, please remember to tread lightly where others are involved. Especially in the home schooling community, we seem to love to talk about what works well for us. While that is a great thing most of the time, sometimes our exuberance gets us in trouble because we offer unsolicited advice. If you ruminate about this long enough, I think you'll understand where I'm coming from. 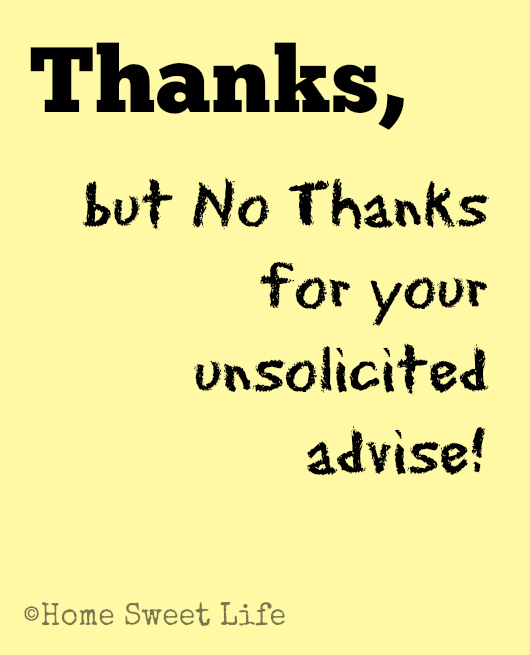 Have you ever had a time where you just wanted to politely tell someone "enough already- I don't want your advice!" There is a fine line between sharing what has worked well for you, whether it be a curriculum, a new stove, a type of tomato, a lifestyle/ fitness change, or a new car, and advising someone else that they should follow your example. Our Women's Bible study group at church has been studying James for the past few weeks. It has been a good reminder for me about choosing my words carefully. For those past times when I've chosen the wrong words, I'm sorry, please forgive me. Let's choose together to remember for the future to find the line between sharing with others and offering unsolicited advise. One of my friends is extremely discerning about this. I appreciate that a lot about her! She is very knowledgeable, especially about home schooling, but she always listens first! Her advise is only given after truly listening to what you're talking about, and some discerning prayers about what she should share. I'm praying to be made more Christ-like in this area. I would hate for someone to say "Boy- she's pushy! Does she really think we should all be doing things just like her?" about me. Yet, sadly, that is often said about many Moms. Moms who didn't choose their words wisely. Moms who told someone else how they should raise their children, or which curriculum is the BEST one out there, or which co-op class they NEED to enroll their children in, or which Dentist is the ONLY place in town they would take their children to. So please, before you offer that next piece of advise- stop, think, pray! Then listen and see if that other person is soliciting your advise. If they are- then share freely, both what works and what doesn't for your family. If not- then politely smile, and keep it to yourself. When we stop talking, it's amazing what we'll hear!